The other night I was beading the ring part of a toggle clasp and decided to try to work it starting from the inner side and zip it on the outer side, instead of the other way around. It turned out great. The donut I chose for this pendant is a very pale green, almost white jade and it measures 55 mm. 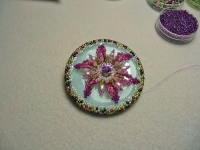 I had to bead the bezel of the donut twice because the first time I put too many beads. Rats! 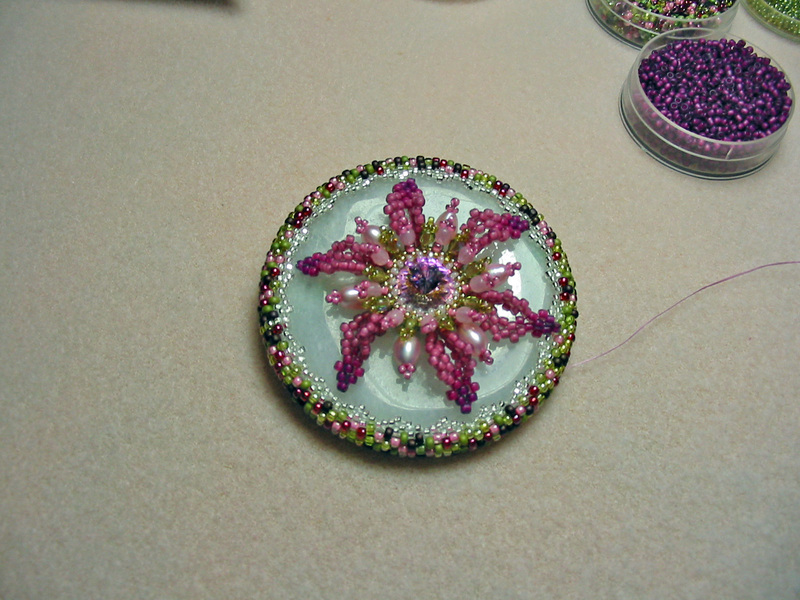 For the center I bezeled a 14 mm Rivoli and decorated it with fresh water pearls, firepolished beads and beaded petals I "borrowed" and adjusted to the Rivoli, from a flower I found in 'The Beader's Floral' book by Liz Thornton & Jill Devon. There are more pics in my Work In Progress photo album. I also finished the Double-Triple Spiral I was working on and added a few more photos and instructions to the Tutorial. yes it's wonderful I love it !!!!!!!! Hi Frany! :-) Thank you!